Why it’s common to feel stuck in midlife, especially your 50s. Why the way you think about being stuck can affect your ability to unstick yourself. How understanding that your excuses are optional can help you move forward. Why not knowing what you want can keep you stuck. Why noticing when you’re envious can help you have insight about what you want. How making a small change can actually propel you forward. It may seem counterintuitive to believe this. Understanding your thinking and then changing your thinking can be one of the keys to forward movement. Being stuck in midlife can feel dire. It’s hard not to hear the “life’s too short” mantra in your head, that you’re running out of time. You start to get worried that if you don’t figure things out quickly you will waste more valuable time. It can feel like the clock is ticking on your life. 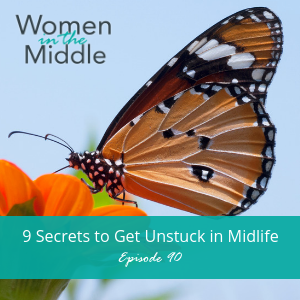 Today’s podcast unlocks 9 secrets to get you unstuck. Each secret also has an accompanying application tip for how to make the tip actually work in your life.